In many marriages, the family home is the couple's most significant asset. For this reason, real estate often factors prominently in divorce cases. Because it is unrealistic for the parties to continue living in the same residence after their marriage has ended, dividing the marital home is one of the biggest considerations in divorce settlement. Before you can negotiate any kind of division, it is necessary to determine the home's value. Typically, real property values are assigned by local government entities -- usually county auditors -- responsible for assessing taxes. These values are not always accurate, though, because they do not include the home's interior value or consider properties in the surrounding area. Real estate agents can also provide a market analysis, which includes comparing recent sales of neighboring homes. The most reliable form of valuation is a professional appraisal. Performed by a licensed real estate appraiser, this type of valuation offers the most comprehensive assessment of a home's actual worth. The divorce settlement does not directly affect the mortgage or the way the house is titled. Because mortgages are based on contract principles, they cannot be altered by a divorce agreement. Furthermore, mortgage and title are separate issues. Title gives you full ownership rights in the property, whereas the mortgage gives your lender the right to foreclose on the house if you stop paying the mortgage note. In most cases, the spouse choosing to remain in the home will refinance to remove the other person's name from the mortgage obligation. Refinancing also provides the party keeping the house with enough cash to pay off the other person's equity interest. In return, the relocating spouse signs over his interest, which changes the title. If you plan to relinquish your interest, make sure the other side's refinancing has been approved before you transfer your title rights to your spouse. Sometimes refinancing is not an option. In a divorce, the household income is divided in two. As a result, you might not qualify for financing on your own. In this situation, it is often possible to satisfy your spouse's equity interest by "borrowing" from marital assets like retirement plans and other types of property. For example, you might give your spouse more than her one-half interest in your pension to offset her equity in the marital home. This equalizes the assets and allows you to keep the house. Delaying division is necessary in certain circumstances. If the couple has young children, they might decide to allow the custodial parent to remain in the home until the children reach a certain age. 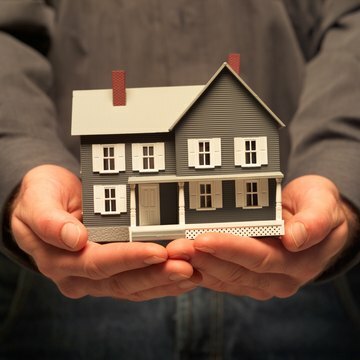 Typically, the person remaining in the home is responsible for paying the mortgage. When the children are grown, the parties sell the property and split the proceeds. In other cases, one party wants to keep the home but either does not qualify for refinancing or can only obtain a loan with unfavorable terms. The parties might agree to leave the mortgage note intact until refinancing is possible. The downside of this is that it exposes the non-residential spouse to liability if the other side defaults on the loan. If no options remain, the parties can sell the house and split the proceeds less any realtor and closing costs.